When you are enthused about old cars it is important to find the right place to do critical work . . . or to find that elusive part. We speak your language! Give us a call for your antique auto needs. You'll be glad you did. And remember, we serve more than just the Spokane area! Antique auto restoration requires knowledge and tools that the average car mechanic simply does not possess. Modern cars are marvels of technological advancement, but do not share many of the parts that were commonly used in the automotive world in the 1950s and earliier. You will not be find a user adjustable regulator or a generator on a modern car. Magnetos and mechanical fuel pumps are also scarce these days. Luckily there are still a dwindling few experts in the country who skillfully rebuild and set up a vintage distributor for Delco, autolite, or even a modern Ford. 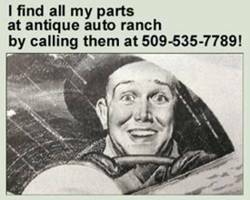 Antique Auto Ranch has a few of those experts on staff. They can also rebuild generators. Those have not been used on most cars since the early 1960s. If you have a single or double diaphragm fuel pump that has developed a leak in the old rubber don't risk a fire by driving around. Get it rebuilt and get some peace of mind. Starters for both 6 volt and 12 volt ignition systems are also a specialty. Another common part that often needs attention is the water pump. Furthermore, there are many parts cars on hand. They just might have the obscure part you've been searching for. It's worth a call! From Auburn to Zephyr they are a vast source of information.